When I was at Channel 4, I was responsible for an unusually large number of controversial programmes. When I say “responsible” for them, what I mean is that, as head of arts at the channel, I was the lamb sent onto Right to Reply to defend them when complaints reached Everest levels. Three films in particular stand out for the quantity of angry doo-doo they brought cascading down on my head. All three had a religious thrust. The first was J’Accuse: Mother Teresa, in which the feisty Christopher Hitchens waded into the theological past of the famed icon of piety. The second was a programme about Chinese modern art, Beijing Swings, during which a Chinese Christian artist, seeking to make vivid the mind-boggling notion of transubstantiation, ate the body and blood of a baby. The programme that brought the most doo-doo down on my head, however, was a film about Jesus’s foreskin. Let me quickly explain — old habits die hard — that this foreskin was not a Channel 4 invention. If only. The ridiculous truth of it was that it existed, and that of all the relics brought back from Jerusalem in the early days of Christianity, the holy foreskin was among the most precious. So much so that no fewer than 18 holy foreskins were in circulation in medieval Europe, each claiming, of course, to be the original. By the time Channel 4 set off to find them, most had miraculously disappeared. The Catholic church had made discussion of them a crime, punishable by excommunication. I remember these absurd events here because the British Museum’s plush, gold-encrusted, chant-accompanied, coffee-table-book examination of Christian relics seems to have left too much of its scholarly doubt in the umbrella stand by the door. The sheer lunacy of the luxurious sights gathered for us here surely warranted some tougher questioning than the happy-clappy relic love-in that is Treasures of Heaven. I felt as if I was touring a display so defiantly old-church that its makers had not even yet dealt with the arguments put forward by that Darwin chappie in his book about the origin of species. See that big bent bit of bone with the silver ends? That is a genuine dragon’s claw. See that golden arm sticking spookily up into the air? That is the arm of St George. Over here is St Blaise’s foot. And inside that rib-shaped piece of gold is St Peter’s rib. As for the precious fragments of the true cross that remain, not just in this show but far beyond it, used together they could provide enough timber to build a barn. The fact is, the world of the medieval relic was a world of fraud, greed, madness, delusion, cannibalism, gullibility and pretence. Absurd things were put on show to manipulate Catholic audiences in unscrupulous ways. Remarkable amounts of money were made from the creation and exploitation of these grotesque objects. I certainly don’t expect the British Museum, under the saintly directorship of Neil MacGregor, to mock any of the mad contents of its spectacularly ornate survey of Christian relic art. But a scholarly nay or two was probably in order. As it is, Christianity was the first religion to worship bits of its deities and saints, rather than their entire bodies. Hands, feet, bones, hair, fingernails, teeth, blood, bodily secretions: they all qualified. The fact that so many early Christian martyrs were hacked to pieces probably triggered the pro cess, and definitely made it easier. But I suspect something inchoate in humanity’s deeper past, some ancient pagan appetite for sou­venirs and amulets, also played a part. Certainly, the forces at work here seem to me identical to the ones that drive Haitian voodoo merchants to collect human hair and insist on virgin blood. The show brings together some of the finest and most beautiful relics scattered about Christendom. In most cases, the bones and hairy bits are not on view, or can only be glimpsed through tempting bar riers of prettifying rock crystal. We are here to admire the packaging, not the contents. What is immediately obvious is that art played a critical role in the rise and conquest of Christianity. Art could make the incredible credible, the ugly beau tiful. That was power indeed. If I put John the Baptist’s broken tooth in front of you, unadorned, I doubt you would find it easy to worship the holy molar. But if I encase it in exquisite crystal, lift it into view in a gorgeous golden reliquary, surmount it with a glowing gold crucifix, I separate the tooth from its reality and make the mundane holy. The opening section turns out to be particularly telling, because it deals with the first attempts to visualise Jesus. With no description in the gospels to help them, the first Christian artists were handed the unenviable task of inventing Jesus from scratch. At first, they were understandably reluctant to put a face to him at all, and in a superb fourth-century sarco phagus, lent by the Vatican, Christ is represented only by his Greek monogram, Chi-Rho. Elsewhere, an impressive Roman mosaic from Hinton St Mary, in Dorset, presents him as an emperor figure: neat, smiley, short-haired, beardless. Next, a breathtakingly interesting carved ivory box, decorated with early imaginings of the crucifixion story, shows us a blond, curly-haired, smooth-cheeked Christ, who clearly began life as the pagan sun god, Apollo. A gold glass ornament nearby makes him blonder still, and even more angelic. A huge religious notion is searching for a simple religious face. On the subject of angels, an adjacent Etruscan sarco phagus shows a large female figure with wings sitting on one of its ends. This winged figure’s task is to guide the dead to their afterlives; and, fascinatingly, this same Etruscan deity was taken up and adapted by Christian artists to become the standard representation of an angel. Thus, the opening stretches of this show record a process of invention involving tons of uncertainty, but not a single given. Only when this new iconography was fully invented could it begin appearing on the ornate coverings of saintly relics. A reliquary was no place for doubts. At the centre of the show, an awesome array of these dramatically precious objects, envisaged in a bewildering variety of shapes and styles, makes instantly clear how valuable relics had become. If you suffer from Stendhal syndrome, hold onto something solid when you enter here. Gold was favoured for the casings because of its inability to tarnish. Rubies had their symbolic value, too, as representations of the blood spilt by Christ, while sapphires were said to have been found in the four rivers of paradise and to represent celestial purity. All this was, transparently, myth-making on the hoof, but how spectacularly it solidified into an unshakable symbolic system. Some reliquaries were shaped like caskets, others like bells. 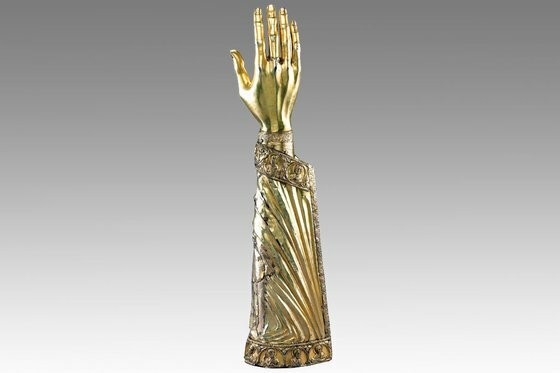 “Speaking relics”, as they were called, mimicked their contents and looked like gold-encrusted amputations from the human body. I was particularly taken by a huge super-reliquary, borrowed from the Basilica of Santa Croce, in Rome, which shows Christ as the Man of Sorrows surrounded by hundreds of different bits of assorted saints, all arranged neatly in little boxes, like an illegal collection of birds’ eggs. A good relic could turn nowhere into somewhere, and might lure pilgrims to your church from the other side of Europe. Despite its deeply inconvenient location, Santiago de Compostela became the prime pilgrimage destination it was, and is, because it came into possession of the bones of St James, with their miraculous healing powers. Middle Ages, the tombs of St Cuthbert and Thomas Becket became important European pilgrimage destinations; while at the far end of the exhibition there’s a set of poignant pic turings of Charles I, the martyr king, beheaded by the Cromwellians. I found these secret little images unusually moving. Compared with the yard-high piles of gold that preceded them, they were humble things. But it was humbleness that gave them their power.